November 2012 Featured Listing by JY&S: 1991 Taswell 49 "Lei'd Ba'k"
49' Taswell All Season Pilot 1991 "Lei'd Ba'k"
Lei'd Ba'k is a pilothouse version of the very popular Taswell 49. Also known as the Taswell 49 All-Season, this blue water cruising yacht has super-yacht style, design and performance by highly regarded naval architect Bill Dixon, all in a yacht under 50'. Built to a high standard by world renowned Ta-Shing, the builder of Nordhavn. This is a rare opportunity for someone to acquire a raised salon designed vessel with inside and outside helm stations. All systems have been maximized for ease of maintenance and reliability. Lei’d Ba’k is a cutter rigged sloop with fully battened in-boom furling mainsail and two furling headsails, the staysail being self-tacking. All sail control lines are led to the cockpit where the vessel can easily be sailed by a couple or even one person when need be. This feature has the benefit of leaving the foredeck clear and open for lounging/sun bathing. She is powered with a 110 hp Yanmar main engine and a bow thruster for easy maneuvering. The pilothouse is designed for great visibility and is a perfect place to be when cruising higher latitudes or retreat from the sun to the fully air-conditioned interior. She features a large center cockpit, an upper and lower salon, secure U-shaped galley and three very well appointed staterooms. The spacious aft master stateroom, with en-suite head and soaking-tub/shower, enjoys a private companionway that leads to an aft cockpit. Sun bathing, dinghy excursions, swimming, diving, or landing that large fresh catch, are enhanced by this large aft cockpit, which has direct access thru opening transom doors, to the swim platform. This is one of the significant design features of this yacht that is normally only found on yachts of 80 feet or larger. Additionally, the aft cockpit seating integrates large lazarettes, one on either side and S/S dinghy davits maintain the clean aesthetic look of the vessel. A transom mounted Edson Radar Post incorporates the Raymarine Digital Radar, various antennae, flood lighting, and security alarm. The forward stateroom is complimented by en-suite access to the large second head with separate shower. A comfortable third double bunk cabin is to starboard. The crews’ lifestyle is supported thru low energy 12-volt lighting systems and an Onan 8kw 110/120 - 220/240 generator. Three separate A/C (with heat pump) units, maintain your desired interior climate. The galley is equipped with a deep stainless double sink supplied with pressure hot and cold water, as well as manual fresh and raw water. A Force-10 three-burner stove and oven is supplied from two large aluminum propane tanks in an outside under deck vented locker. A stainless microwave oven. Separate Grunert holding plate refrigeration and freezer units are located in the galley (AC and engine driven compressor options). Additionally, in the upper salon is a built-in stainless Isotherm refreshments refrigerator/freezer (AC or DC powered). Anchoring is handled easily by a 3500 Maxwell capstan rope/chain windlass with controls at the inside helm and also via handheld remote control on the foredeck. The 73lb Rocna anchor is coupled to 280 feet of galvanized 3/8"BBB chain. Lei'd Ba'k is perfect for a cruising family or couple to live aboard and enjoy long distance voyaging in safety and comfort. She has the preferred 5'10" shoal draft keel and offers excellent performance in different wind and sea conditions. Asking 379,000 and located in Fort Lauderdale, Florida. Click on the following link for Full YachtWorld Specifications. For more power and sail listings, please see our yachts for sale webpage. 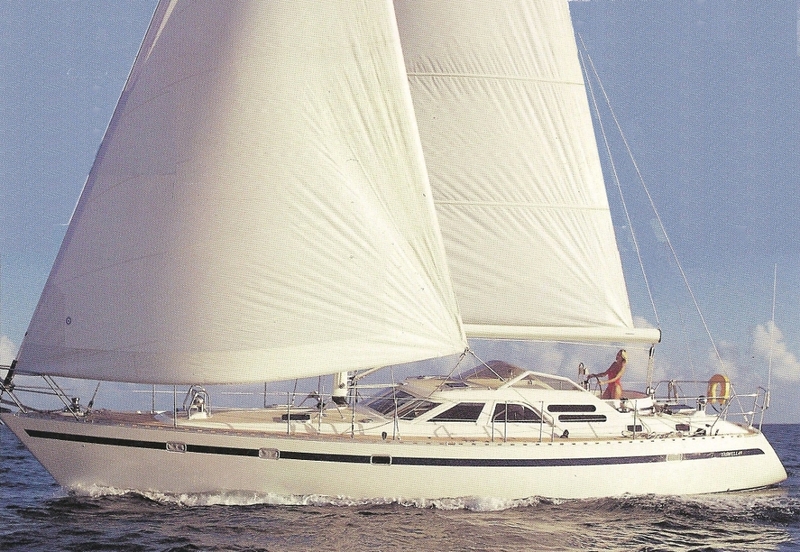 Re: November 2012 Featured Listing by JY&S: 1991 Taswell 49 "Lei'd Ba'k"